I’m always saying that drinks can be a difficult aspect of the Specific Carbohydrate Diet (SCD). I was never a huge fan of fizzy drinks but I would enjoy a cold glass of Coca Cola on a rare occasion. I was partial to some orange juice with my breakfast the odd day. Little did I know how much pesky sugar was added. SCD doesn’t allow many drinks that you can buy in the shop – either alcoholic or non. That means us SCD-ers have to get a bit inventive. Enter, iced coffee! My love for a good coffee runs deep. Having lived in Italy during my college years, I became a proper addict. However, with the Crohn’s diagnosis came the cruel reality that I would have to give up coffee for good. Even though I never stopped loving coffee, I had to accept that my coffee drinking days were over. Hard times! Fast forward many years later to now when I have been on SCD for almost two years. I still know my limits. I won’t have a coffee every day. Sometimes, I push it by having one too often and I pay the price. I also always drink decaf now but I am very selective where I’ll have one. I’ll always ask if the decaf is proper coffee and if it’s instant I’ll pass. I’d rather wait to have a really good coffee that waste my time drinking a bad one. Life is just too short to drink bad coffee! I’ve talked before about making sure the decaf coffee you choose has been decaffeinated by a natural method. You can read more about that in my ginger orange cookies blog post. This Iced coffee is great to make if you, like me, always make too much coffee and have some left over. I can’t believe I used to throw the leftovers away! That was before an Italian friend explained to me that in Italy, they would put cooled down coffee in the fridge and have it with ice in the summer. Genius! Less waste and a new SCD-legal drink to enjoy. I make my coffee for this iced coffee recipe in the traditional Italian way on the hob with a “Moka” pot. You can pick these up easily in most homeware stores these days. My favourite brand of coffee is Lavazza decaf. They state clearly on the label that the coffee has been decaffeinated by the natural CO2 method. In general, I avoid coffee brands that don’t advertise how they decaffeinate. I figure, they would be boasting about it if they were proud of it! You can see the brand of premium coconut milk (without additives) that we use here. I’ve recently seen the contestants on Masterchef Australia using this brand also. We must have good taste :)! 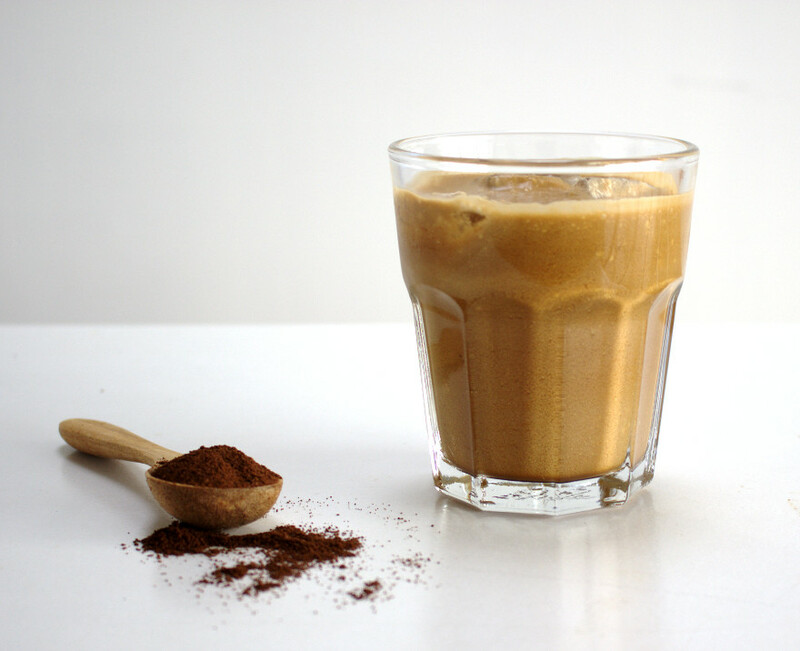 A delicious dairy-free iced coffee drink free of refined sugar. Paleo-friendly and suitable for the Specific Carbohydrate Diet (SCD). All the coffee to cool to room temperature and for best results, chill for a further 30 minutes. Mix the cooled coffee with coconut milk and add honey if desired. Add a few ice cubes and enjoy! *NOTE: Instant coffee is not allowed on the Specific Carbohydrate Diet (SCD).